When I stared blogging on This Online World, everything was all about phone farming. From my phone farming guide to posts on the best phone farming apps, the entire hobby has really become a significant component of this blog. I’ve also spent a lot of time exploring ways to earn passive income, how to make money online, or the best online jobs people can use to earn additional income. All in all, the theme of making money online or side hustling has come to embody what this blog is really all about. I will admit I have also strayed away from certain money making avenues or side hustles. For example, in my post on the best and worst side hustles, I advised against solely relying on programs like Mturk or paid survey websites to make extra cash. Personally, I’m more of a passive income advocate, and I personally don’t use micro-work task or surveys to generate income. However, I think it is important that I explore a variety of methods to earn money online, and completely omitting surveys, Mturk, or other forms of income from this blog would be a mistake. So, I have set out to examine the world of Mturk, paid surveys/GPT sites (get paid to websites), and other money making methods. Ultimately, I really am looking to find out just how far you can take the world of beermoney. I’ve mentioned the beermoney Reddit community before in my phone farming posts, and that’s for good reason: beermoney has taught me everything I know about the topic. Beermoney is really a community of people who just want to make money online. The best paying GPT websites. Signup bonuses and various product offers. Cashback or money saving applications. While the name implies people are only looking to scrape $30-$40 together for some weekend beverages, the community of beermoney is more than that. In my opinion, it’s really all about people who are looking to make extra income to better their lives and achieve their goals. Some use beermoney as a way to save up for a new video game, chip away at grocery bills, or even build up a small pool of money to invest. However, beermoney isn’t just a simple side hustle to make an extra $20 for everyone. In fact, some people are pushing beermoney to an entirely new level, and that’s what I want to share today. I’ve spent a lot of time browsing the beermoney subreddit, and while I rarely contribute, I thoroughly enjoy learning about new money making apps or ways to make money online. If you’re a frequent visitor to r/Beermoney, you will also know that 2 users have become immensely important pillars for the beermoney community. These users are Fishering and TheMightyOx. 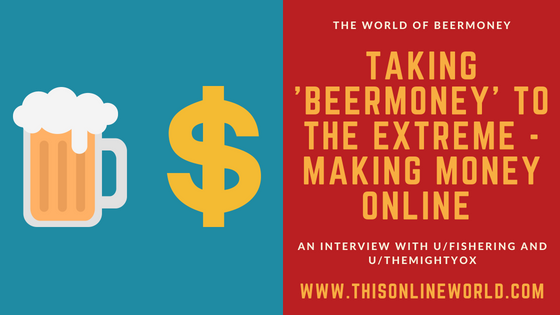 TheMightyOx is an absolute legendary figure in the beermoney community, and that’s for good reason: he makes an incredible amount of money through beermoney related work and he shares his expertise with the community. 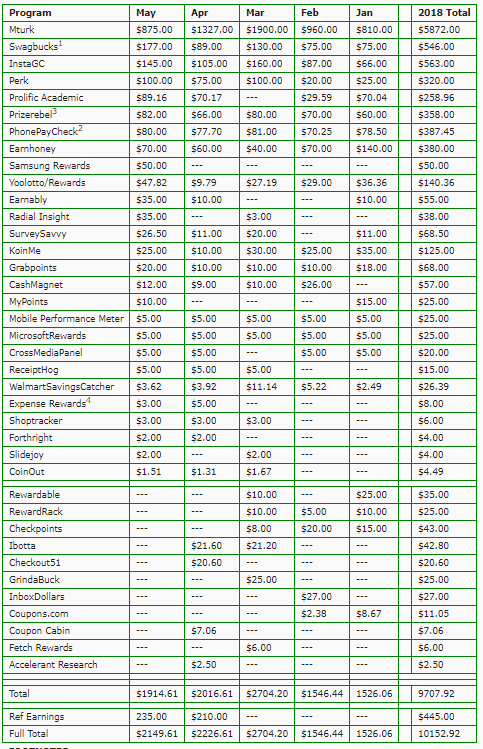 TheMightyOx grossed over $2,000 in March alone through a mixture of Mturk work, passive income sources, and GPT sites. Earning this amount of money from beermoney work is simply incredible, and it does prove that with enough time, dedication, and effort, you can make a considerable amount of money online. I started to notice Fishering on the beermoney subreddit when his answers kept on providing me with the exact information I was looking for. Fishering is one of the most knowledgeable, helpful, and generous member out there in Beermoney, if you ask me. He also plays a major in many beermoney related trading groups, and he periodically publishes immensely informative posts like this passive data collection app comparison chart. All in all, Fishering and TheMightyOx are definitely names you recognize and respect if you’re in the beermoney space. This Week in Beermoney is a podcast that highlights the most prominent events of the week in the beermoney community, and runs every Saturday at 8:00pm EST. This Week is Beermoney is a great way to learn more about the world of beermoney, the best money making apps, and ways to earn money online. Plus, the episodes are streamed on Twitch.tv and it’s a great place to hangout and have some fun. Additionally, there are some interesting guests from the world of beermoney who will be appearing on the show, so it will be one exciting summer for beermoney! After catching the first episode of This Week in Beermoney, I decided to reach out to Fishering and TheMightyOx with some questions to learn more about the world of beermoney. I’m happy to say that they were able to provide some great insight into the world of beermoney and their experiences. So, without further ado, let’s get into the interview! Question 1: How long have you guys been doing beermoney and how did you start? Fishering: I started doing beermoney when I was 12 years old. Yeah, I broke the TOS of every site because the requirement was to be 13, but I really wanted a Club Penguin membership, and my dad wouldn’t buy it for me, so I took things into my own hands. That was in about 2011, so I have been doing beermoney for just over 7 years now. The first site I found was a classic GPT site similar to Swagbucks. Beermoney was extremely hard at first, and I think it took me weeks to earn enough for the Club Penguin membership… just to be banned during ID verification when the site realized I wasn’t 13. I think the way my eyes opened more is when I asked support “are there any sites like this one” and they told me to google “GPT sites” and I found a massive list of similar sites, and it eventually led me to finding a whole catalog of options and different ways to make money online. Ox: I started earning online back around 1999 or 2000. Back then companies would pay you to run an ad bar at the bottom of your screen as you surfed the web. I moved on to paid-to-read-emails and surveys after that in the mid 2000s. Took a break for a few years and then got back into it about 2012. Question 2: How big a part of your life is beermoney? Fishering: Oh man, Beermoney is a huge part of my life, but not exactly in the way that most people would think. A lot of people send me messages asking how many phones I have and how many computers I have and how my beermoney setup must be insane, but really… it isn’t. People think I spend all day doing beermoney things and making money, but for me I spend most of that time researching new opportunities for the sake of sharing them. Ox: Earning online like this is a huge part of my life. It’s my entire income and how I live and such so at this point, it’s a life line. Question 3: What is your greatest beermoney success story? 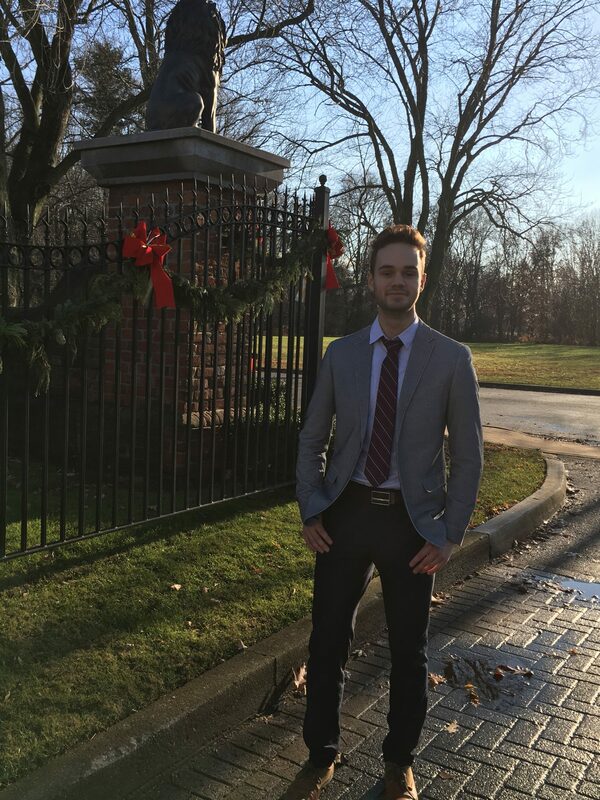 Fishering: This is probably one of the most impossible questions to answer… Opportunities in Beermoney tend to come and go, but maybe some of the biggest successes come from the consistent earners, like how each day I watch my lifetime Perk points get closer and closer to that 10 million mark. There are also the beermoney successes like discovering a new site that earns super well, or getting a big win on HQ Trivia. There are many new opportunities all the time, and they all come with their own successes. Ox: I think my biggest success is ongoing. Since the beginning of this year I’ve managed to completely pay off 5 credit balances. And if things go decently right, I’ll be completely debt free by this time next year. Question 4: Where do you see the world of beermoney in the next 5 years? Better, worse, different? Fishering: I see beermoney being better in some ways, worse in some ways, but ultimately different in most ways. Beermoney is always evolving, sometimes for better and sometimes for worse. Some people say that as more people get into beermoney, the amount you can make goes down, but this isn’t necessarily true. As more people get into beermoney, opportunities grow. It’s the same reason that HQ Trivia is able to give out up to $2.8 million in prizes through the next week or so with their Toon Blast sponsorship. So what’s different? I feel like beermoney is going to become even more mainstream than it currently is. I feel like the term beermoney might slowly go away, and just about everything we do in life can be monetized in one way or another. Ox: It’s so hard to figure out trends in this industry. Things change fast. I do think passive is slowly dying. New apps that are coming out are requiring major interaction. How slow this happens remains to be seen. I think we will see new stuff we haven’t thought of crop up. It’s an adventure. Question 5: What’s one tip you would give to someone who was looking to gradually incorporate elements of beermoney into their life? Fishering: One major, major misconception about beermoney is that if you’re going to get into it you need to invest and devote a lot of time into it. This is absolutely not true. There are tons of different sites/apps you can sign up for once and just make money passively, almost just for breathing. I’ve written two posts about this alone, lots of different ways to save money passively, and lots of ways to make money passively. If you’re someone who is working a 9-5 job and has little/no free time, you still have options, and after an initial sign up on a bunch of different apps/sites, you could start seeing yourself saving hundreds of dollars each year. Whether it’s your natural purchases like groceries, a negotiation on your cable/wifi/cell phone bills, or passive income apps, you could earn or save hundreds of dollars a year passively, and it won’t take up much of your time. Ox: I think if someone wants to get involved in this, and it’s just for some extra money…the first thing they need is a goal. Are they saving for something? Trying to pay down debt faster? Putting aside money for the holidays? Without a goal, boredom is a big problem. And after that. Just relax and do what you can. Use your leisure time while watching tv or whatever to make some money. That’s all for the questions! I would like to thank Fishering and TheMighytOx for taking the time to provide a deeper look into the world of beermoney. These 2 guys are truly awesome members of a very great community. I think the world of beermoney is absolutely fascinating, and it’s also different for everyone. Some of us just want to passively earn or save a bit more money whenever we can, or start a small side hustle to buy that shiny new video game or Amazon gadget. For others, beermoney is a much larger source of income, and goes beyond a simple hobby. However, whatever beermoney means to you, I think one thing is clear. Anyone can take actionable, calculated steps to improve their finances and life. It doesn’t matter if you’re a student, work from home, or have a 9-5 job; there are ways to incorporate some beermoney practices into your life and to be more financially savvy. 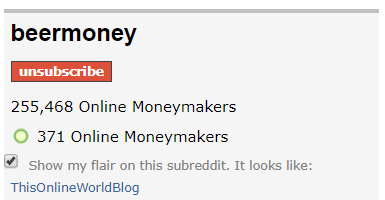 If you are currently struggling with finding viable ways to make money online, I would highly suggest looking into the Reddit Beermoney community for some initial guidance. And, if you do, be sure to remain on the lookout for the solid advice that comes from Fishering and TheMightOx. The internet is a vast place, and if you apply your skills, knowledge, and some effort, you can start making progress towards your own goals. Be sure to check out Episode 3 of This Week in Beermoney this Saturday at 8:00pm EST. 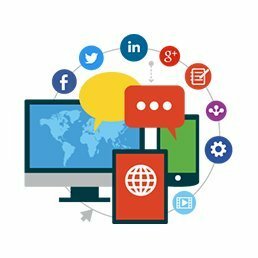 Also, if you want to follow Fishering and TheMightyOx for some more valuable insight into the world of beermoney, check out their socials! Fishering’s YouTube – where This Week in Beermoney is also posted. This Week in Beermoney Podcast.